Our van only has one key. It's one of those with a chip in it, so it costs insane amounts of money to get a 2nd one made, like $100. I can think of about a million things I would rather spend $100 on than a key to my van. I know I probably should get one, but it never seems to make it to the top of the list. Anyway, that's to say that we like to leave the keys in a central location. In our last place, we had one of those boring key hooks, which worked well, but I thought I'd get a little more fancy this time. 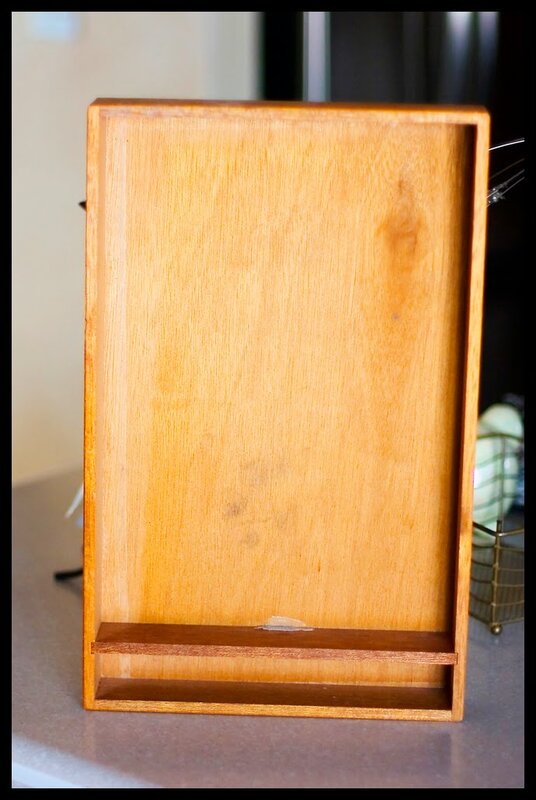 A while back I bought a utensil organizer from Savers for one fifty, which I mentioned in this post. I thought it would make a great message center (I keep calling a message board, which is just confusing, and poor David is thinking I'm talking about something on the computer, whoops). Well, I did it and it's hanging in my kitchen on my beautiful green wall. It's not quite that bright in person. I love green and white together, especially with touches of teal. Sigh. Lightly sand the box. Paint and let dry between coats. Cut out a piece of pattern paper for any areas you might want to cover. 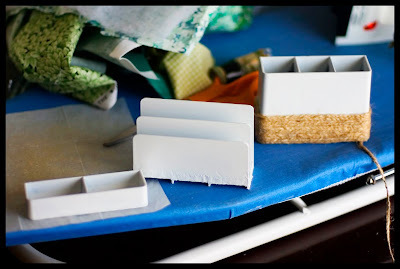 Use a light, even coat of Mod Podge to glue it to the box. Let dry overnight, then put on a top coat. Add sawtooth hanging hooks to the back. I use two on either side for stability. Next, determine the placement of your ceramic bird. Mine was from Dollar Tree and I use a coat of white to freshen it up. You are going to want to put in a screw coming up to set the bird on. I did this because I was worried if it came unglued that it would fall right off. 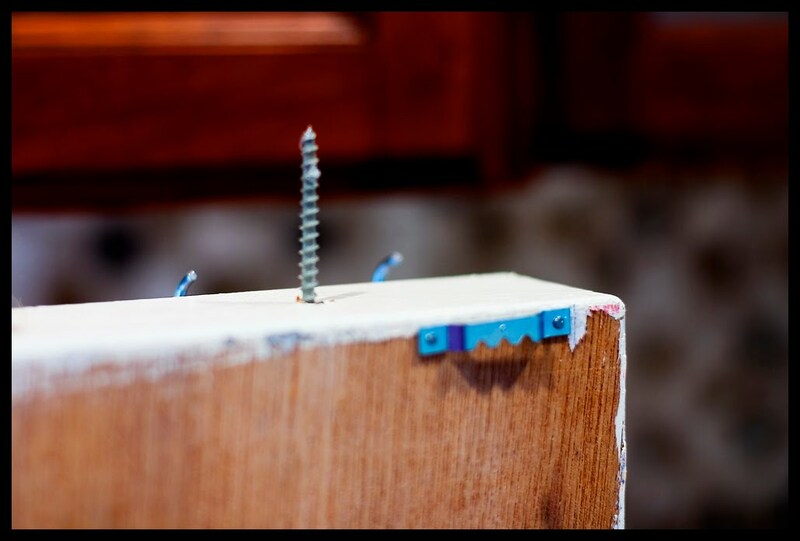 Make sure the screw is the right size. Drill a guide hole and then attach the screw. Measure where you want the cup hooks to go. 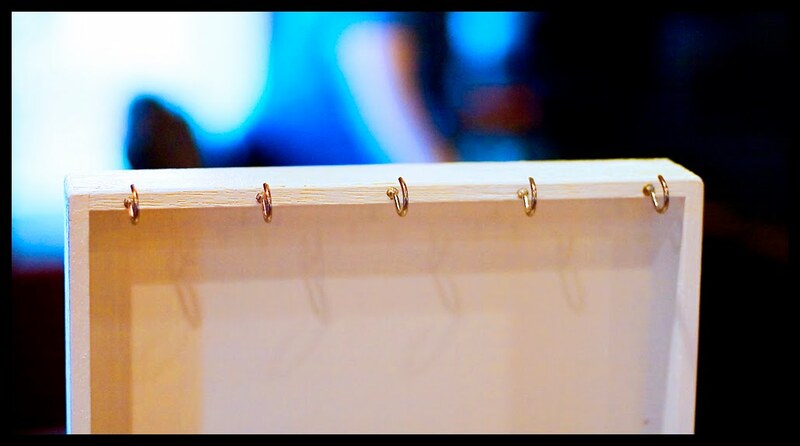 Drill guide holes and then put the hooks in. Now we are going to work on the office organized parts. They had two identical ones in different colors, so I think they are probably not too hard to find. I basically cut it apart with a hack saw. First time to use one and it was kinda fun. Once I had three sections, I used the rotary tool to even up the edges a bit. Then I used the spray paint that sticks to plastic to paint them white. Once I had a few coats on and they were dry, I used hot glue and jute to cover up the not so pretty parts. 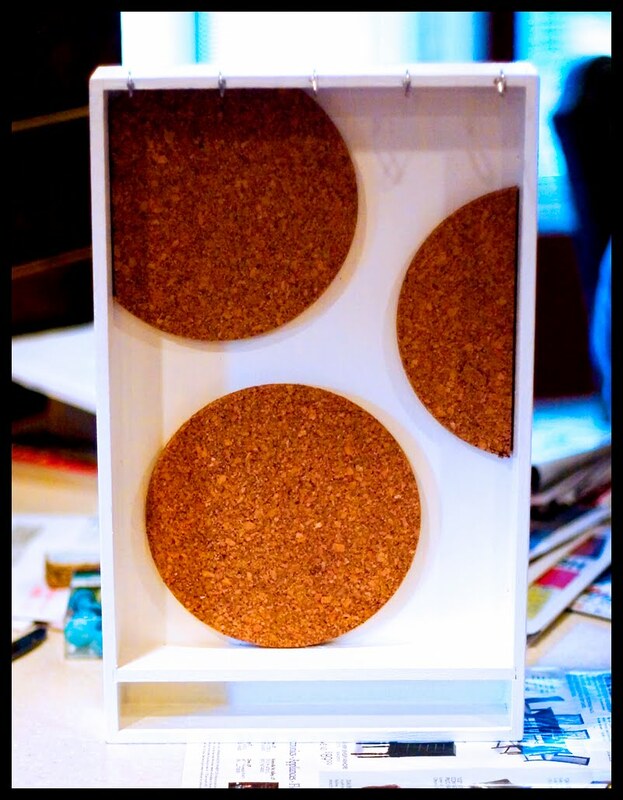 I knew I wanted some sort of cork board on the back to pin up notes or messages, so when I found these pot holder things from IKEA, I knew they were perfect. First, determine placement. 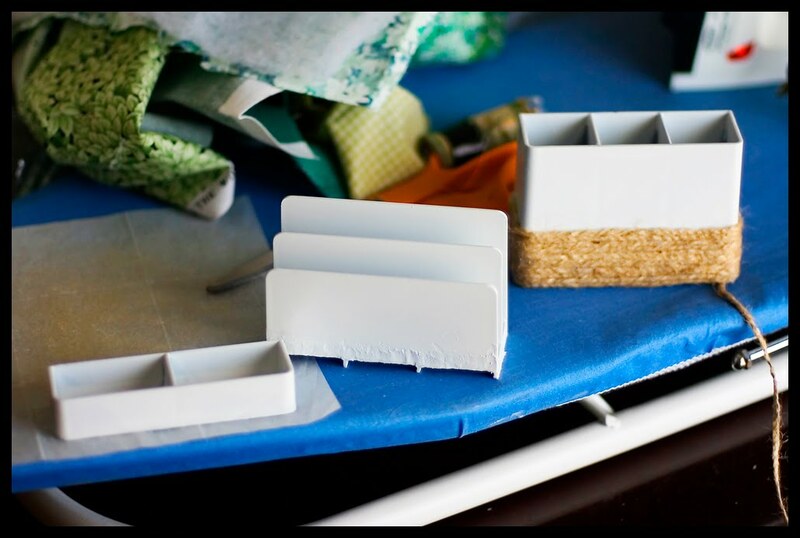 Use a quilting ruler and a craft knife to cut through the thickness. Dry fit, then glue in place with liquid nails or other strong glue. I used hot glue, but I'm dubious about how well it's going to hold. 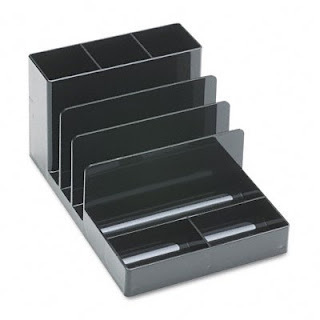 Glue your office organizer parts in place. Glue on your ceramic animal (I used super glue), making sure it will hang flush with the wall. Hang and start using. 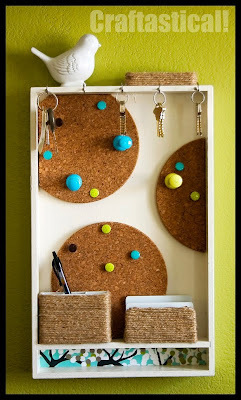 By the way, the fun over-sized and pattern tacks are from Walmart. Sheesh, those pins were a splurge, but they are so cute! Oooh, love your key shelf and the off balance cork circles and the color combo and even the fat little "watch bird" on top. Those fat little birds are everywhere, have you noticed? So cute! your message center is adorable. You did a fantastic job. so cute! I have to agree they are cute! I mean, you can't have it this nice without spending a bit. But at $17? Wow, you can make a fortune selling those the way big companies do. This is really great!! Thanks for the idea!! 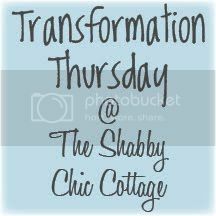 Visiting from theshabbychiccottage! What a clever idea. Just an FYI....Walmart makes most chip keys for a fraction of the cost. Visiting from HOH link.